Summer is officially here at the Rup House! We finished school yesterday! That means the kids can have a little more movie/television time. Of course that mean we watch some educational shows - but they can be disguised fun kids shows. Thomas Edison's Secret Lab: It's Always Sharkest. Is a perfect dvd to pop in when the littles want to watch but I want what they watch to be quality. This show features everything to do with science. We take a gentle approach to our homeschool science the first 3 years of schooling. This basically means we read a lot about our world, environment, and animals. I love adding videos to that time to reinforce what we are learning. Thomas Edison's Secret Lab has been a great addition to our school time. Unknown to the world, Thomas Edison built a secret lab where he invented a virtual version of himself and a steampunk robot named Von Bolt. Years later, Angie, a twelve-year-old science prodigy, discovers the lab. Join Angie and friends as they learn and explore a variety of science topics from a shark's sense of smell to plants and pollinator's roles to radioactive decay to DNA and more! While visiting one of Kent's relatives, the kids come up with a great idea for attracting more tourists to his restaurant - the only catch is that it also attracts a very big shark with very big teeth! What will the Secret Lab Kids do? 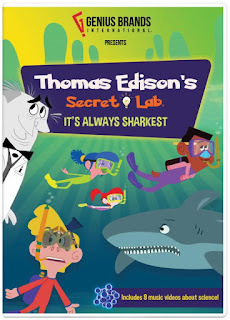 Guided by fun-loving Edison, Angie and friends will show just how fun science can be! My favorite scientist is Rosalind Franklin.